Tenzan stones are mined as a boulder not suffered by obstructive pressure and contains a lot of bluish plagioclase, so that the stone is shining transparent, like a blue ocean. 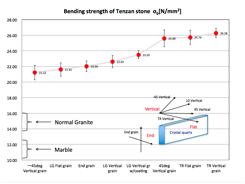 It not only has the third best water absorption characteristics following Ukigane and Bicchu-aomikage, but also the best compression and bending strength characteristics in comparison to any other "Waseki" (Japanese stones). 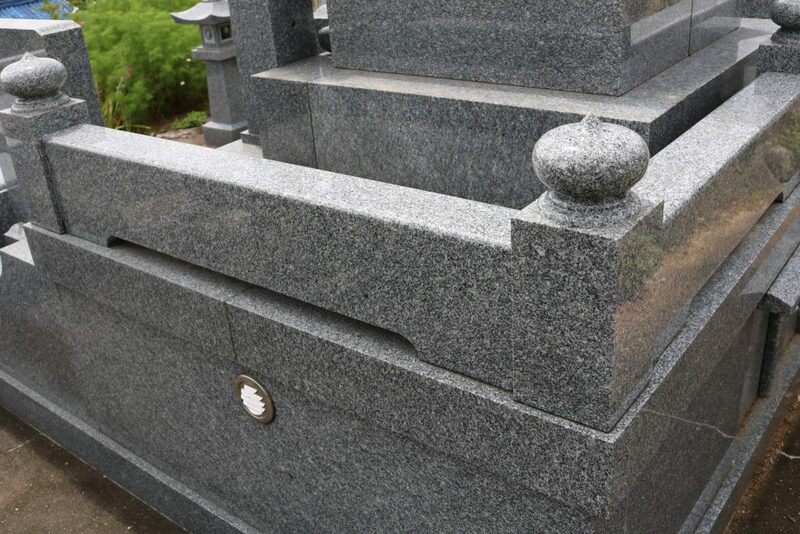 As a result, tombs made of Tenzan Stone are still brilliantly shining even after 50 years without degradation such as color change, a decrease in glossiness, rust, surface roughening and/or exfoliation. 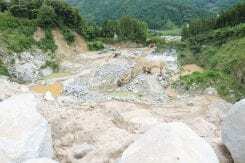 ◆ Water absorption(%) … Percentage of increase weight due to the penetration of liquid water into the dry stone. 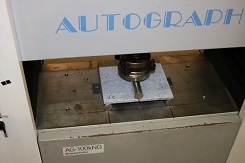 Stone with a small number is preferred for less degradation, and maintaining color and shine. 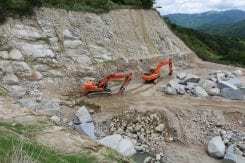 ◆ Compression strength(N/㎟) … Maximum load that can be applied to stone before the stone is crushed. 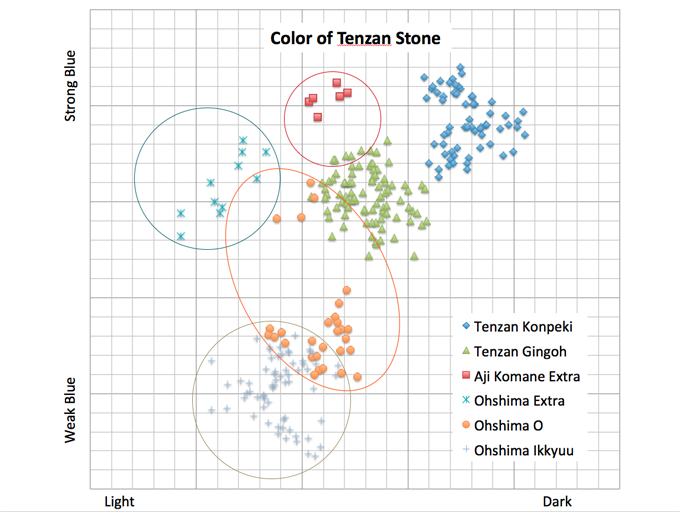 An index of stone hardness. 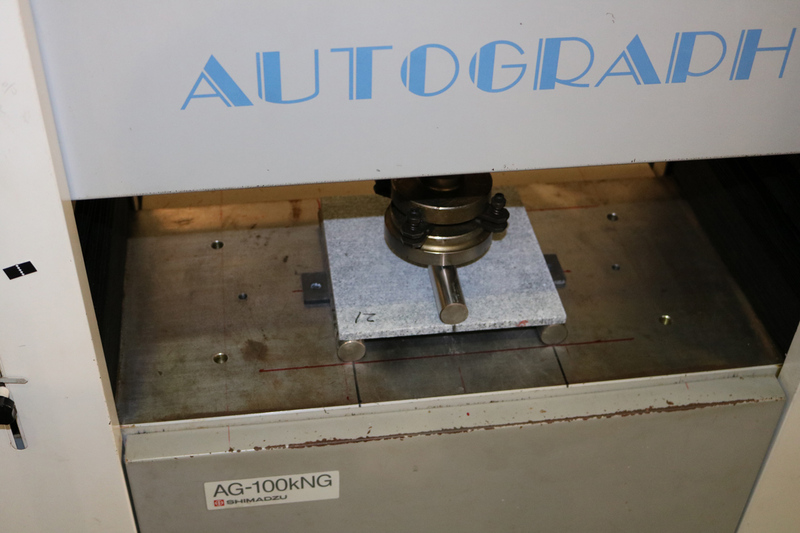 We evaluated the bending strength for Tenzan Stone at the Industrial Technology Center of Nagasaki in compliance with JIS A 5411. 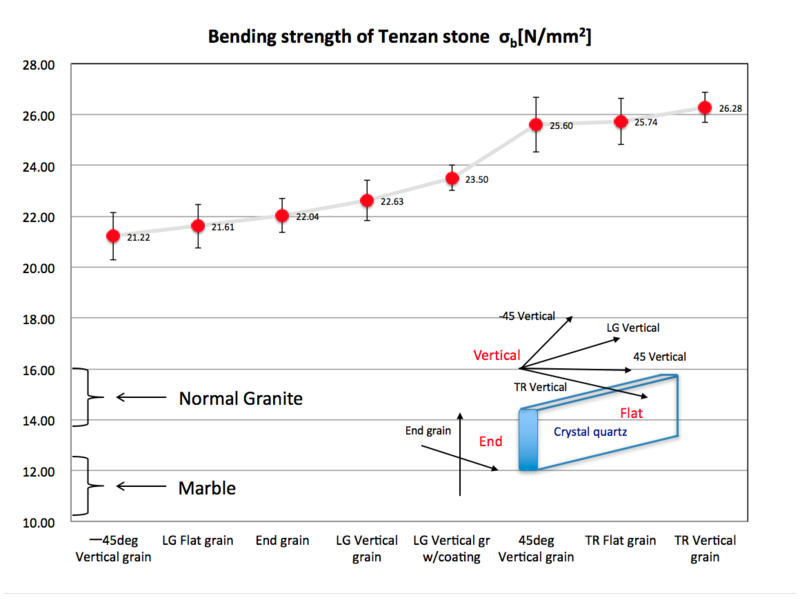 We have measured the bending strength for characteristic angles of quartz crystal grain whose definition is shown in the figure. 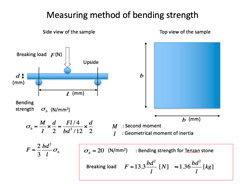 The bending strength is highest for transverse direction to the vertical side of the the grain, while is smallest for -45 degree direction to the vertical side of the grain. 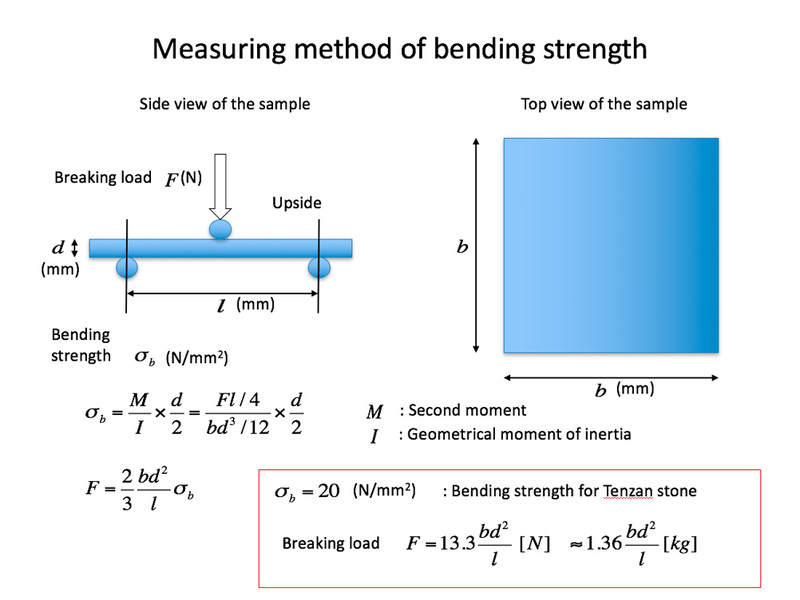 We found that the bending strength of "plain" Tenzan Stone is more than 20 [N/mm2] even for the weakest direction during the experiments. We also found that the bending strength for the weak angle becomes stronger and has less variation with coating epoxy resin sealer on the back side. Please compare the pictures of tombs made of andesite, granite and Tenzan Stone, respectively. 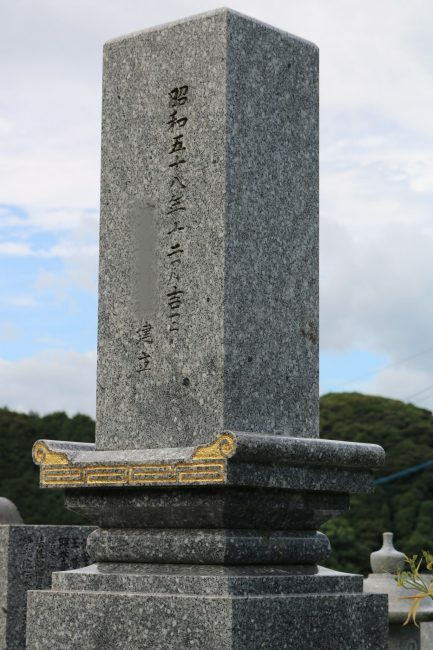 The tomb of Tenzan Stone is still shining, No color change, No moss on the surface of stone even under the same circumstances as tombs that are erected in the same graveyard. 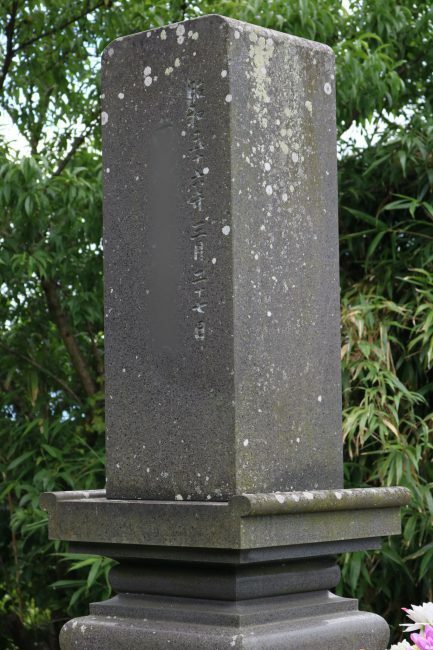 Tombs of Tenzan Stone are still brilliantly shining even after 38 years without degradation such as color change, decrease in glossiness, rust, surface roughening and/or exfoliation. 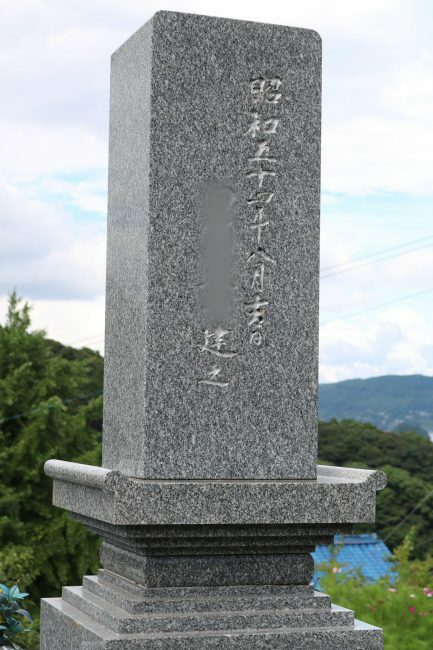 We cannot comment now how long Tenzan Stone keep shining, because no more than 50 years passed since the former president of Tenzan Sekizai Co. LTD. discovered the Tenzan stone. 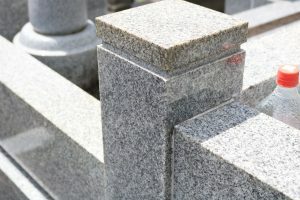 The color around the edge of the normal granite stone is changed caused by the physical decomposition and deterioration of its material. No discoloration and No deterioration in physical properties are found in Tenzan Stone after 40 years and are expected to keep the present conditions for many years to come. 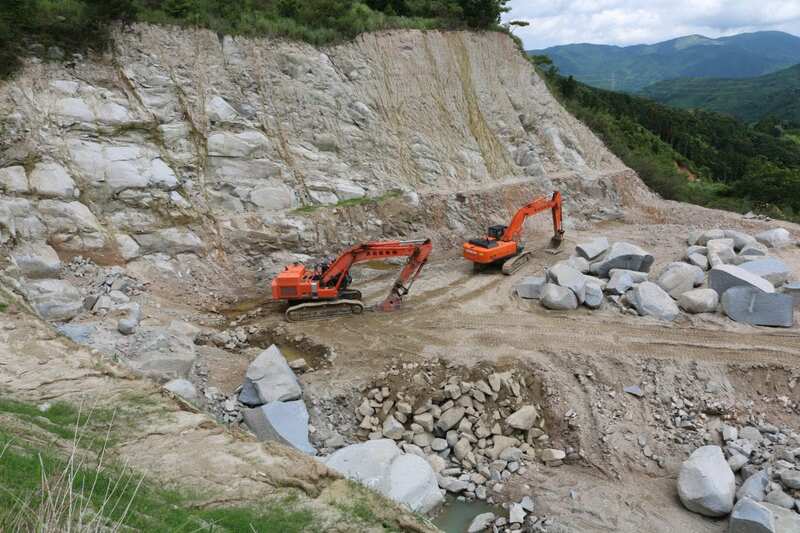 Tenzan Stone is made of granodiorite which is classified as the material between granite and diorite. Granite mainly contains quarts, plagioclase and biotite, whose color changes depended on the composition of a plagioclase feldspar denoted by its overall fraction of anorthite or albite. If potash feldspar decreases and sodium‐calcium feldspar increases, then the stone becomes dark and changes to diorite. Tenzan Stone belongs to granodiorite containing a lot of bluish plagioclase rather than potassium feldspar, and is very hard and is also shining transparent like a blue ocean. 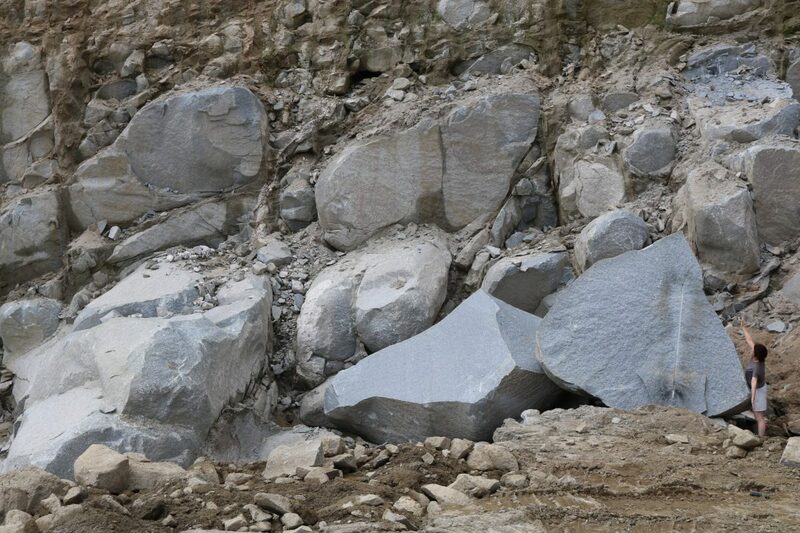 Granites are rocks that make up the crust and are distributed throughout the Earth. Continental granite has many Potash feldspar from pink to pale pink and white rocks are few, while Japanese granite has many plagioclase and white rocks are frequent. Since a lot of granites are produced around "Mikage" town in Kobe city, the granite is also called "Mikage" stone in Japan. However, the granite around here has a lot of Potassium feldspar and has a pale pink color. The Tenzan Stone production site is located upstream of the Tamashima river in the Nanayama area of Karatsu city. 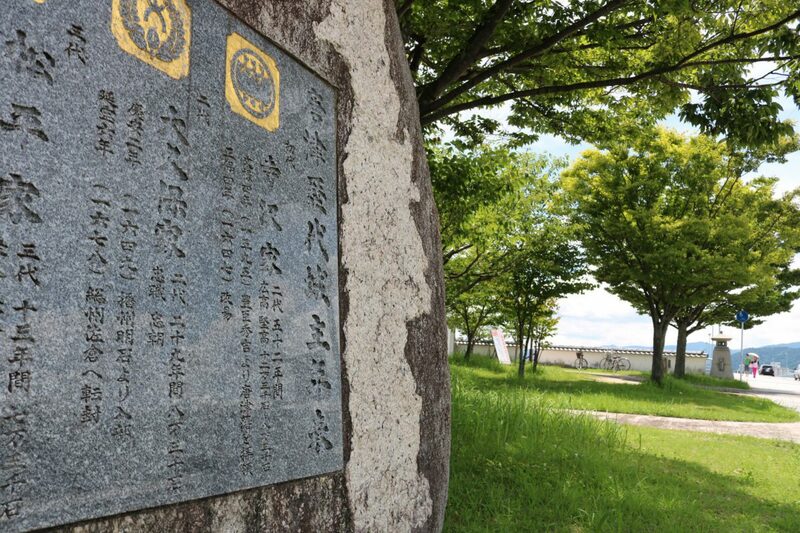 As the description in "Manyohshu" (Collection of Ten Thousand Leaves) and "Kojiki" (Records of Ancient Matters) , Empress Jingu visited this area and fished at Tamashima river sitting on the rock (Suirin-seki 垂綸石) about 2000 years ago. Suirin-seki is made of the same granodiorite as Tenzan Stone. Yamanoue-no-okura 山上憶良 wrote "Waka", an old style of Japanese poem, about the episode of this stone and Empress Jingu in the "Manyohshu" about 1300 years ago. 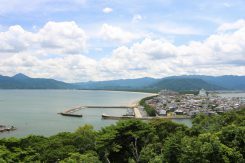 The Hata family had reigned over Matsuura, the region around Karatsu city, for about 400 years under the Kishitake Castle. 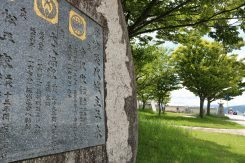 After the second dispatch of troops to Korea, TOYOTOMI Hideyoshi placed Lord Hata Mikawa-no-kami Chikashi in confinement at Tsukuba, and ordered to make the Kishitake Castle close. Terasawa shima-no-kami Hirotaka was called from Nagoya to the current castle place by Hideyoshi and constructed the Karatsu Castle in 1602 as a vassal of the Tokugawa clan. Since Hirotaka supported the Tokugawa clan in the Battle of Sekigahara, he also reigned over the Amakusa area as a reward. The Terasawa clan was broken at his heir for only two generations, then the families of the Tokugawa clan took over the Karatsu Castle. 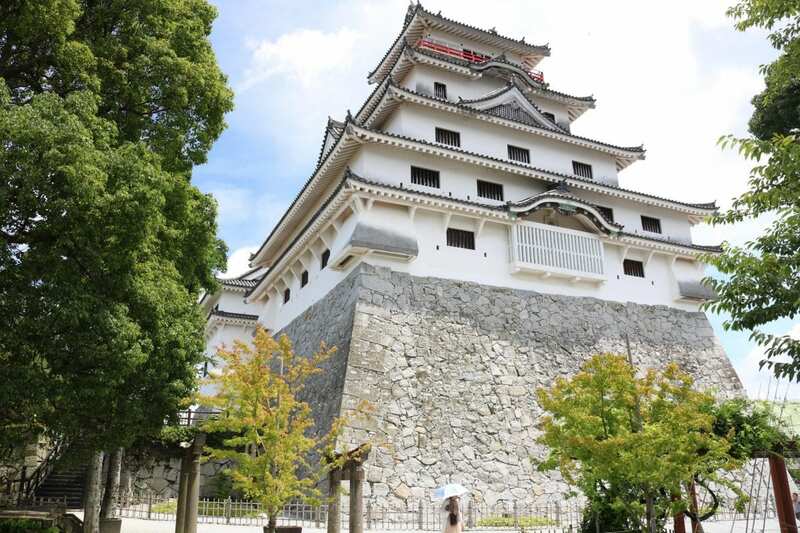 The stone steps and wall of the Karatsu Castle were constructed using granites in this area. 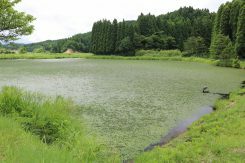 It is conjectured that the stones had been carried via the Tamashima river and/or the Matsuura river to the castle site downstream. 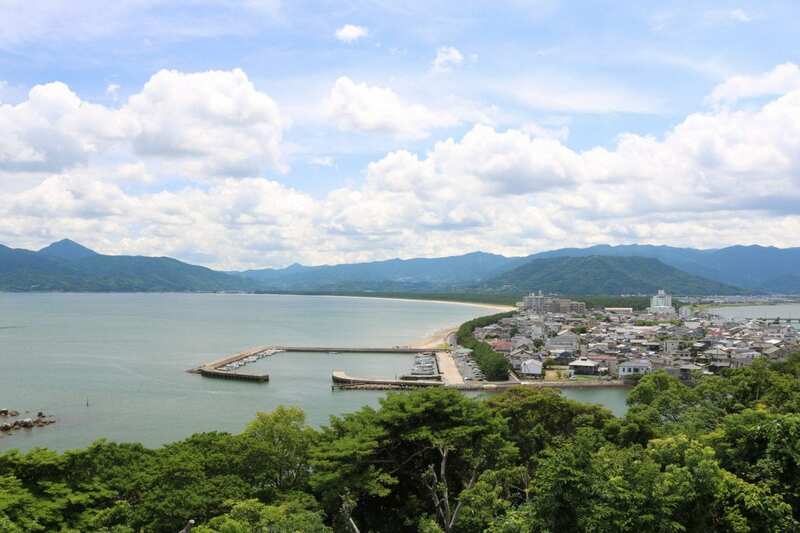 The Tenzan site is located in Ohyasiki area in the Nanayama district which is located in a direction midway between east and southeast from Karatsu Castle, via a nationally designated place of outstanding scenic beauty "Niji-no-Matsubara." The sight lines, which reach to Mt. Tenzan and Mt. Seburi, range between Saga and Fukuoka prefectures. The Tenzan site is surrounded by beautiful nature, and the most famous place is "Kashibaru-shitsugen": a marshland located on a high altitude neighboring mountain. 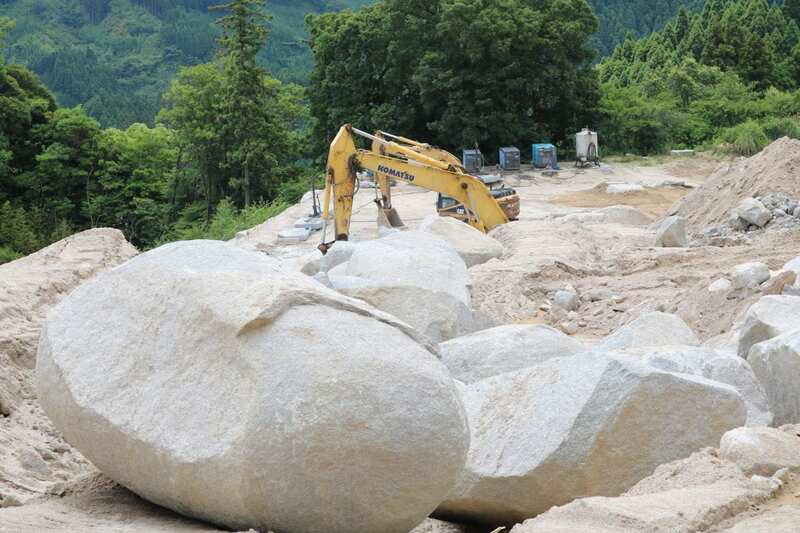 Tenzan Stone is delivered from the site surrounding a great nature area while considering environment in harmony with nature.